There is a lot about theming custom blocks, but what about blocks created by views? I try many ways for naming template file, ex: block--block--views-posts-listing-block.tpl.php, but I can't find correct file name. This question was about D7 ... Why the Drupal 8 in your answer? @Pierre.Vriens since question is popular in views (not the module), I figured I should add a D8 version answer in here. Now that's an interesting idea ... How about doing the same for these +21K questions also then? @Pierre.Vriens most of those are not popular. Without the spaces (I couldn't edit this properly to allow it all to be inline. I confirm noTxt is correct, go to the block section, and edit the block, the url should show you the view's block name with underscore, my_view_name-block. replace the underscores so my-view-name, and use this format: "block--views--my-view-name=block.tpl.php"
Yes, this is more correct answer, so: block--views--VIEWNAME-MACHINENAMEOFDISPLAY.tpl.php Attention to single dash before Machine name! Machine name = by default it's named as block, block-1 and so on, but you can rename it in views UI. The file name patterns describe above works UNLESS your view name + display name is longer than a certain amount of characters!! I was caught by this and could not find why a template file ending in ...block.tpl.php was working and the following display ...block-1.tpl.php was not working. It turns out that Views replaces the machine name with an MD5 hash if the name is too long. If you want to be sure of the template name you should be using, add $conf['theme_debug'] = TRUE; in your settings.php and then look at the page source. if you find something like block--views--d131dd02c5e6eec4.... you'd better shorten the machine name of the view (if you manage do to that... It's not the human-readable name). Or else you need to use a template file with that silly name. block--views--[view-name]-[display-name].tpl.php should be changed to block--views--[view-name]-[machinename].tpl.php. [view-name]-[display-name] part can be found like noTxt said or joining with a '-' the id name of the view and the id name of the view display, the -block at the end isn't correct. Edit your view. 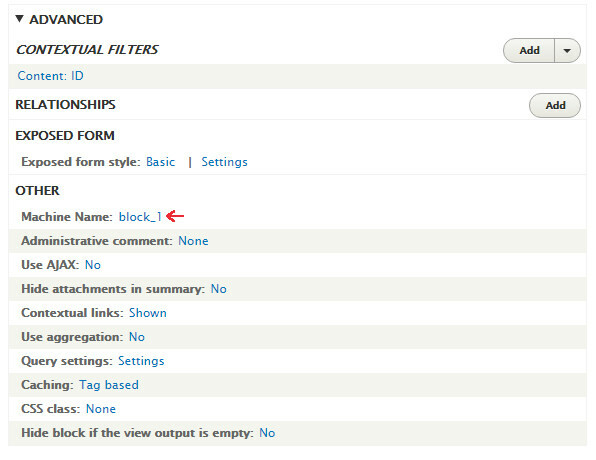 and Under the "Advanced" settings of your Block details, click on "Theme: Information". A list of options of template files will be displayed. for example: your block has the name posts listing, and has style unformatted, then "Theme Information" suggest the name views-view-unformatted--posts-listing--block.tpl.php (this is only one of several names). you can copy the original views-view-unformatted.tpl.php template file (located in /modules/views/theme) to your current theme directory, and rename this file with the name suggested :views-view-unformatted--posts-listing--block.tpl.php. then make the changes inside your template file. If this template does not allow make your wanted changes, seek other templates according your needs. Important! When adding, removing, or renaming template files, it is necessary to make Drupal aware of the changes by making it rescan the files on your system. By clicking "Rescan template Files" button you clear Drupal's theme registry and thereby trigger this rescanning process. The highlighted templates (in your template list above "Rescan template Files" button) will then reflect the new state of your system. Hello, please review again the list of templates indicated by "Theme Information" in View->Block settings, there are several templates that end with --block in his name. Remember reescan templates, and remember put the template inside directory of your current theme (copy the selected template from modules/views/theme). the template must have the name suggested by the "Theme Information" list. It works. @drupality, I have added an example with steps to review the process, please review in "for example" paragraph, in the answer. @drupality, regarding remove default div class="content", you can overwrite the specific CSS rules that are making problems with other CSS rules (inheritance precedence). Or also you can add classes to your view to change this. Or also you can use !important CSS declaration to give more precedence to your rules. Or also you can assign classes inside your templates to control with more detail. @moon.watcher I think you misunderstand. Ending the template file with "block" doesn't affect the theming of the block itself. It makes that template file specific to the block that the view is outputting (as a view can output multiple blocks from the same view). The themed content from the view is output to the block theming engine, and is wrapped in the markup provided by block.tpl.php. What drupality is trying to do (as well as I am) is change the theming of the block itself. This answer completely misses the point, and yet is highly upvoted and even the accepted answer, but why? Ignore it and go to noTxt's answer if you want the solution for the actual question posed, about the block that contains the view not the view itself. It's weird really that the developers even left that out of the views theme information. [SOLVED] How do I create a custom template for view? [SOLVED] How is a theme template file picked up?